Ministry of Housing and Infrastructure has revealed plans to close some lanes of Sina-Male' Bridge at certain times to facilitate the removal of the trestle bridge beginning from Monday. 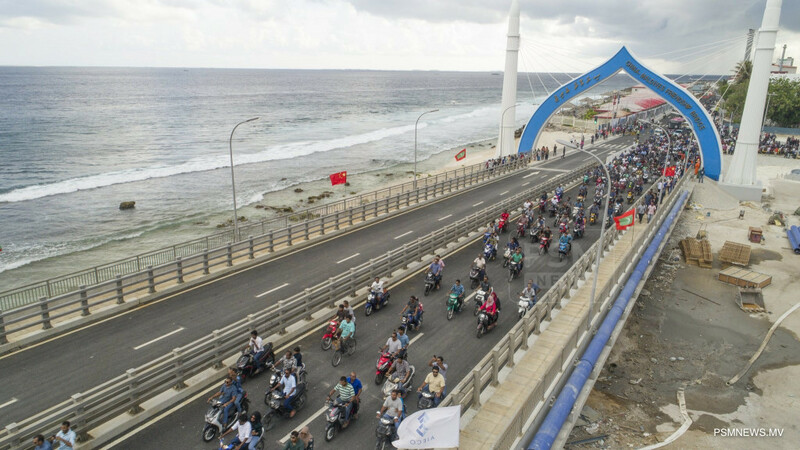 Some lanes will be closed at certain times to remove the trestle bridge placed to construct the Sina-Male' Bridge, Housing ministry stated, adding more information will be issued by the traffic police. Moreover, housing ministry has advised to refrain from using the lanes when closed for the safety of the people crossing the bridge. While the some interruptions will be caused following the decision to close off lanes for traffic, CCCC Second Harbour Engineering Company has revealed the removal of the trestle bridge is conducted according to the schedule. In this regard, the contractor revealed all the decks and platforms of the trestle bridge placed for the bridge construction have been completely dismantled. Highlighting it is very difficult to remove the steel pipe piles, the contractor expressed it is waiting for suitable sea conditions for the operation of the floating crane barge for the removal of the 37 steel pipe piles. Sina-Male' Bridge designed and constructed to cater to the service life of 100 years will be maintained and managed by the contractor for a period of two years. Although a ministry statement said some lanes will be closed at certain times to remove the trestle bridge, Minister of Housing and Infrastructure Dr. Mohamed Muizzu said no permission was issued to close any lane of the bridge.